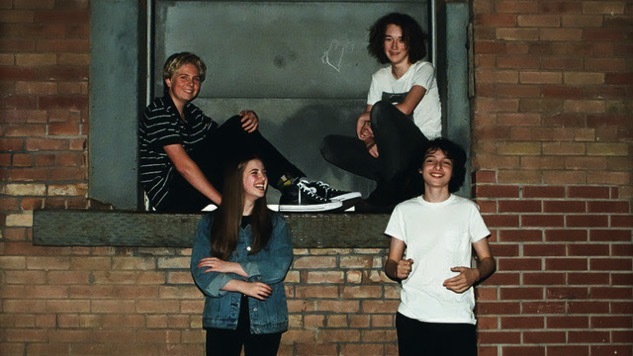 Teenage Vancouver indie rockers Calpurnia, fronted by Stranger Things and IT star Finn Wolfhard, will release their debut EP this spring via Royal Mountain Records, and our first preview of the band’s self-titled record has arrived. “City Boy” is the lead single from Calpurnia’s forthcoming EP, which they recorded in Chicago last November, with production from Twin Peaks frontman Cadien Lake James—his fingerprints are all over their promising first track. “City Boy” debuts today along with a music video directed by Whitney bassist Josiah Marshall, who filmed the band while they were recording their EP. The single itself shares the video’s infectious, youthful energy: Singer-guitarist Wolfhard laments his situation as the song’s titular “city boy,” falling for the “city girl” who’d rather date “the city tool” than his “city fool.” Meanwhile, Malcolm Craig and Jack Anderson hold things down with loose percussion and nimble bass lines, respectively, while lead guitarist Ayla Tesler-Mabe takes multiple opportunities to shred, delivering licks that cascade over the track like molten lava. This video is a look into a day in the studio working on our record with Cadien, filmed and edited by our now great buddy Josiah Marshall. Hopefully this video can convey how much fun this whole experience was for all of us, and that this music is really just the product of a bunch of friends who love music coming together to create something. We also want to thank Jason Bartell for creating the character you see here in this video, and who you might see more of soon. Lastly, thank you to Martin McPherson for making our video so much more colorful with his animation. This truly has been a team effort, and there is no team of truly talented individuals we’d rather be working with. When I found out my friends Cadien and Andrew were recording this project I was excited to come in and shoot some video and stills. Ayla, Jack, Malcolm and Finn were fun to hang with and it was nice to watch their recording process as talented individuals. I’m excited to see what’s next for these kids. Calpurnia signed to Royal Mountain and announced their debut EP last fall. The band will hit the road this summer to tour in support of their EP, performing at Ontario’s recently announced Royal Mountain Music Festival alongside the likes of Mac DeMarco, Ought, U.S. Girls and more. Watch the band’s “City Boy” video below and stay tuned for more from Calpurnia.